Add the finishing touch to occasion outfitting with this clutch bag from Chesca. 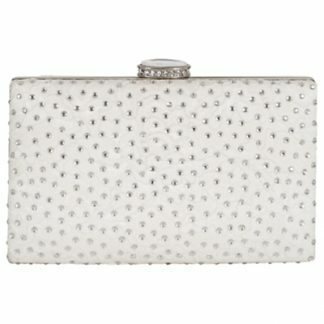 Sleek and structured, this bag features a silver-toned metal frame with a statement jewel clasp fastening at the top. It is adorned with floral lace on one side and glistening diamante detail on the other. Fully lined with soft satin to keep essentials safe and secure, it features a detachable shoulder chain for optimum versatility. The perfect accompaniment for special occasions and evenings out.